Here is a new scanner that we are really excited about. 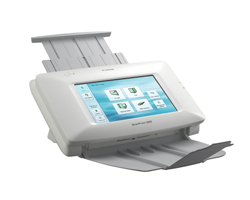 It scans directly to e-mail, FTP, shared-folders, and USB memory. You can choose from personal and shared address books and customize Job Buttons. So for example, you can have accounting people log into the system simply by using the build in finger print recognization and scan directly to a accounting folder. You can use Laserfiche import agent to automatically import the documents into Laserfiche in the proper folders. Another easy method using the email feature, you can email documents directly into specified folders in Laserfiche using the Email Importer we developed. If you would like to see it in action, just let me know. Are Scanned Images better than paper document? I don’t think just scanning your paper work and storing them on your server is much better than just keeping the paper! Now, many of you who have read other articles I have written or have talked to me know that I am totally sold on document imaging/management technology. So, why am I saying that scanning isn’t a whole lot better? Because, we store documents, either paper or digital tally, so that we can find them when we need them. If you are scanning and storing PDF’s on a drive, it is often becomes difficult to find the document you want. You mainly have to know the name of the document of the particular document you need. This is not evident at first when you begin scanning, because you only have a few documents. But, as time goes on, you find that you have folders with many documents and not knowing the exact name, you have to open each one at a time until you find the one you want. Not, much different that rummaging thru a four drawer file cabinet and just as time consuming. Many people, myself included, have use the “document management” capability build into their CRM or ERP system. And it works great at first until … guess what, suddenly you have lots of documents and they are same problem. Document imaging systems allow you to find a document quickly without knowing the name, just a bit of information about the document. With indexes and full text search capability, it is just seconds until you have the document you need. Remember, the reason you are storing documents is to find them when you need them!